Satisfy your inner craving for chocolate and simultaneously boost your alertness, energy and strength with our decidedly moreish maca chocolate smoothie! This deliciously rich and creamy smoothie contains a generous serving of organic maca powder – the renowned ‘aphrodisiac of the Andes’ that’s packed with beneficial nutrients including vitamins (B1, B2, C and E) minerals (such as calcium, potassium, magnesium, sodium, zinc, copper, selenium, manganese, tin, iodine, phosphorus, sulphur, silicon and bismuth), enzymes and every essential amino acid. It’s also brimming with wholesome raw cacao powder for an irresistibly intense chocolaty flavour that’s a perfect match with maca and guaranteed to have you coming back for more! This Moreish Maca Chocolate Smoothie is ready in next to no time. Simply place all of the ingredients into a blender and blitz for around 30 seconds or until all of the ice cubes are finely crushed. 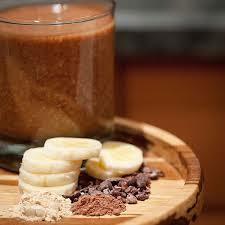 Pour into a tall glass, dust liberally with raw cacao powder or sprinkle with raw cacao nibs and serve immediately. The post Maca and Chocolate Smoothie appeared first on Superfood blog - Healthy, Rawfood Lifestyle.